It was one of those rare sunny days back towards the end of April, when I wanted to spend every possible second outside and taking every opportunity to get out the house and stroll through the streets of London town, when I found myself in St Martin’s Courtyard, in Covent Garden. Armed with my new camera I desperately tried to make the most out of my afternoon there, so set myself the challenge of finding three things to do in this hidden corner of the tourist centre of London. Beginning with a trip to Yotopia, I endured enjoyed my first experience of hot yoga. The studio is located on a little side street and I couldn’t resist giving it a try – I’d heard from friends about how the classes are famed for helping you loose weight, and Yotopia boasts some of the best instructors and luxurious facilities in the capital. The class ran for just over an hour, and we must have done over 30 different postures and breathing exercises in the warm (but not too hot) room overlooking the bustling streets. I emerged from the class feeling as though I’d earnt a hearty lunch, so I met up with Charlie and we made our way to Jamie’s Italian in the main St Martin’s Courtyard area. With real life sun beaming down on us as we sat by a large open window, it actually began to feel positively summery, so we went all al-fresco and ordered the meat platter and some seriously tasty berry cocktails to start. I was almost tempted to go for something healthy after the Hot Yoga class, but after spotting their Crispy Porcini Mushroom Aranchini balls on the menu, I couldn’t even think about anything else. Charlie went for their superfood salad for his main (OK, I admit I did have food envy) and I made up for all the burnt calories by ordering the Italian Steak Frites – a dish I’ve become rather obsessed with recently, as you get all the taste of a steak but without the hefty price tag! After all the food we consumed we decided to burn a few extra calories by exploring the shops nearby, before our feet could carry us no more, so the last port of call was for a quick neck and shoulder massage at Relax. Another hidden gem but perfect if you just want to chill after a few hours of marching through the shopping streets, it costs just £25 for a chair massage and it even revitalised me so much that I was able to go for another round of shopping to finish off the afternoon! 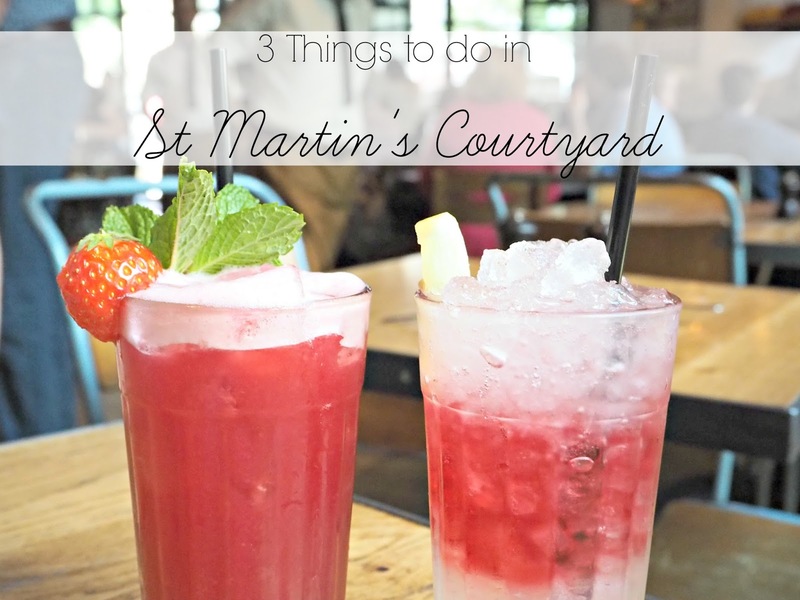 Have you discovered St Martin’s Courtyard yet?